Paul McMahan won the Sears Craftsman Dash to earn the pole of the 35 lap Feature alongside Jason Johnson as both veterans looked for their first Outlaw wins of the year. McMahan led the opening circuit and continued to lead through a pair of cautions in the first handful of laps. The tricky Lawrenceburg cushion got the better of Sheldon Haudenschild after the young Wooster, OH native pulled a massive slider for fourth on Lap 3. When action resume, McMahan led as Schatz and Kyle Larson stalked closely behind. Brad Sweet established himself as a threat early moving by his good friend and fellow California native Larson for third on Lap 5. As lapped traffic intensified, Paul McMahan bobbled out of turn two on the ninth circuit and Schatz and Sweet both pounced, shuffling the Nashville, TN driver back to third. Larson and McMahan waged war for the third position as Sweet began chasing down Schatz. As is typical at The Burg, slide jobs were plentiful as The Greatest Show on Dirt lived up to its name in the fullest on Memorial Day. Schatz was masterful in traffic as always, but Sweet was just as good as the duo sliced and diced their way through slower traffic. Simultaneously, McMahan and Larson exchanged multiple slide jobs for the third position, with Larson finally wrestling the position away on Lap 21. After clearing a handful of lapped cars, the top three were nose-to-tail with 10 laps remaining. Sweet gained on Schatz on an open track and made multiple bids for the lead, before completing the pass on the nine-time Series Champion in turn two to lead Lap 26. A lap later Larson battled hard with Schatz for the runner-up position and had it as they crossed the line. 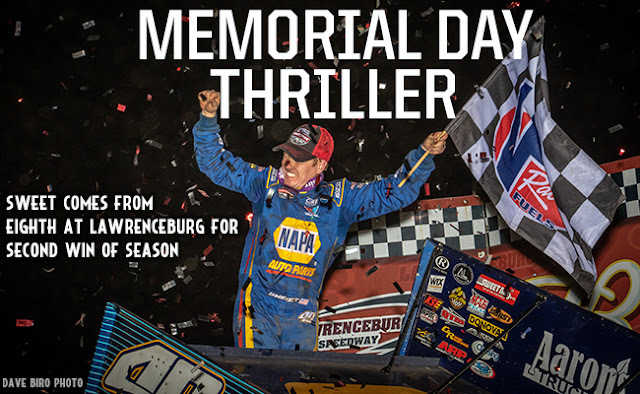 Larson and Schatz continued to battle, but the Lawrenceburg cushion got the better of the California phenom as Larson spun in turn four, leaving fourth-place running McMahan nowhere to go as the caution waved with seven circuits remaining. On the restart, Sweet showed the speed that got him to the lead from eighth and powered away from the field as David Gravel went side-by-side with Schatz for second and grabbed the position before the final caution flew with three laps remaining for Ian Madsen, who succumbed to a flat tire ending his top-ten run. Gravel took a look underneath Sweet on the restart, opening the door for Schatz to steal second back from the CJB Motorsports No.5. Schatz had nothing left in the tank to come back after Sweet, as ‘The Big Cat’ crossed the line 1.460 seconds ahead of the Series Points Leader. “I had a really good race car. It’s better to be in second sometimes, it allows you to move around,” Sweet said in Victory Lane about his pass for the lead. “We were terrible in the Dash going from sixth to eighth, but I was able to try some different lines, allowing us to make some changes for the Feature. We kept getting better and better as the race went on. It’s great to get this NAPA Auto Parts team in Victory Lane where they belong, hopefully we can keep this momentum up in the upcoming summer months,” Sweet said with positivity. Schatz settled for second and endlessly thanked his Textron Off Road team for their continued work and was thankful to finally have the whole crew back, a rare occasion this season. “I tried to go for the lead on the restart and lost a spot. We’ll take third, I can’t thank my guys and car owners enough for this opportunity,” Gravel, who set fast time during Qualifying, said. “Hopefully we can continue to qualify well and build off of this going forward. Shane Stewart finished fourth, ending his winning streak at Lawrenceburg with Parker Price-Miller coming from 16th to complete the top five. Aaron Reutzel earned KSE Hard Charger honors advancing 15 positions, from 22nd to finish seventh. The World of Outlaws Craftsman Sprint Car Series continues its 40th Anniversary Season Wednesday, May 30 with the Series’ inaugural visit to Fairbury American Legion Speedway (FALS) in Illinois. Tickets for the can’t miss event at FALS can be purchased here. The Series then treks to I-96 Speedway in Michigan on Friday before heading to Wilmot in Wisconsin to conclude the weekend. If you can’t make it to the track, be sure to watch all the action LIVE on DIRTVision.com!